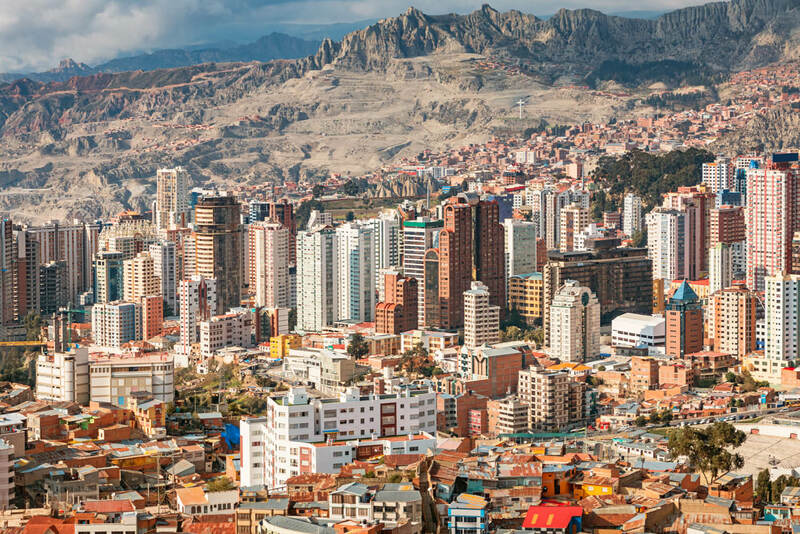 You’d think the fact that La Paz is a city located at the bottom of a canyon would be its most interesting feature, but trust me it has so many more. The capital city of Bolivia, La Paz encompasses the colourful lifestyle and unique landscape of South America perfectly. The city will leave you in love with Bolivia’s bright and bold culture, and a dose of fresh and crisp air. While travelling across South America, I can honestly say I wasn’t as excited to visit Bolivia as some of the other nations on my itinerary. La Paz is a city that you don’t really expect too much from and has a reputation of being unsafe, but boy did it prove its worth! It is the highest administrative capital in the world sitting at more than 3500 metres above sea level. With Mt. Illimani as its backdrop, the city’s landscape is nothing like you’ve seen before. The higher you climb, the more stunning the view. The rich culture, the unbelievable history, the vibrant atmosphere, the friendly people, the mouth-watering food and the incredible landscape, La Paz has all the characteristics of a must-see city. Although some more northern parts of the city are deemed unsafe due to theft, the majority is full of curious tourists like yourself and a helping hand. Manoeuvring around is quite the adventure, and the best part is, you can do it all in 48 hours. One of the major attractions of La Paz is Yungas Road, also known as Death Road, and you can’t visit the city without giving it a good run. It was built in the 1930s as the only route from La Paz to Coroico, although its narrow, high and sharp turns soon made it a deadly path for travellers. The only way you should conquer the road these days is with a mountain bike. There are a few different tour groups that offer excursions, though I would highly recommend Gravity Assisted Bolivia. They’re pricey but safe, provide great detail along the way, and the day is organised well. Once breakfast at Cafe Del Mundo is ticked off, you’re in for a long bus ride, hours of mountain biking and a trip to the La Senda Animal Refuge. Price is $174. Day one is jam-packed and the only way to finish it off is with a good late-night feed. Pollos Copacabana is the most popular fast food restaurant in Bolivia and you must experience its deliciousness. Its burgers are fatty, its chicken is greasy and its plantain chips are the bomb! Ornate alley in old town La Paz Bolivia. After a massive day, you’ll want to hit the sheets for a good night’s sleep before another early morning. My personal hotel recommendations include Hotel Rosario, Stannum Boutique Hotel & Spa or Presidente Hotel. They are clean, conveniently located close to shops and restaurants and have friendly and knowledgeable staff to help with any questions you have. If you have a bit more energy then you should head straight to Wild Rover Hostel, the number one hostel in La Paz. Its bar is loud, its atmosphere is buzzing and makes for a very fun night meeting fellow travellers. Just don’t go to bed too late! South America boasts some incredible coffee. Luckily for you, HB Bronze Cafe recently popped up in the centre of La Paz and stocks some of the most incredible coffee beans from not just SA, but all around the world. Each coffee is brewed and served in its traditional way, so the baristas put on a bit of a show. I’m a massive fan of walking tours. In La Paz, Red Caps is known for its incredible walk through. They’re informative, quirky and very well organised. Plus, only cost $4! My tour starts at Plaza San Pedro and then continues on through the major markets of La Paz, San Francisco Church, Plaza Murillo and a complimentary drink at Sol y Luna cafe. The guides are passionate about their city, the nation of Bolivia and, what they admit is, their crazy history. My favourite part of the tour? San Pedro Prison. Second favourite? The incredible chorizo sandwich you’ll down for lunch at the Rodriguez Market. It sounds a bit funny, visiting a cemetery while on holiday, but you won’t ever see one quite like this. La Paz’s main city cemetery is vibrant and loving. The cemetery is so full that the graves are being stacked on top of each other and the street art on the side is big and bright. The best time to go would be during Day of the Dead celebrations at the start of November. The best way to get there is by bus and during the day, as it isn’t located in the safest of areas for tourists with pickpockets and gangs lurking at night. One significant feature of La Paz is its cable car system Mi Teleferico. It’s not only the most efficient way to get around the complicated city, but also the most impressive. The view of the canyon is second to none. To make the most of your trip, head on up to El Alto and visit the Flea Market, which is one of the biggest in the country. Beware though, there are known to be pickpockets throughout this part of the city, so wear your backpack in front and pack away your camera. You can’t leave La Paz without heading to a Cholita Wresting Show. It’s the WWE of Bolivia and is quite the night out! It’s best to book a tour through your hotel as you want to go in a group and with locals. NOTE: Wrestling shows only run on Thursdays and Sundays so time your 48 hours wisely!